In His Campaign Ad, Georgia State Sen. Michael Williams Says He Will Deport People Using A Bus This week Georgia state Senator and gubernatorial candidate Michael Williams released a campaign video featuring his "Deportation Bus." The side of it reads, "Fill this bus with illegals." 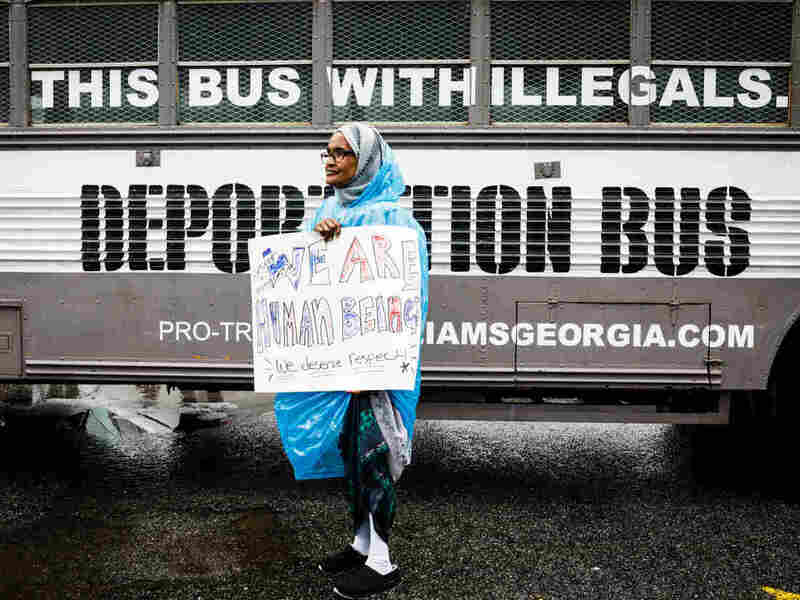 Amina Osman protests Georgia state Sen. Michael Williams's "Deportation Bus" that reads "Fill this bus with illegals." She has been a resident of Clarkston, Ga. for nine years and is a refugee from Somalia. About 300 protestors met him at a strip mall in Clarkston, Ga., a suburb of Atlanta, which is sometimes called the South's Ellis Island. Emblazoned on the side of the gray school bus are the words "Fill this bus with illegals." The back reads,"Danger! Murderers, rapists, kidnappers, child molesters, and others on board." And, "Follow me to Mexico." The side of the bus features a seal resembling the more familiar one from U.S. Department of Homeland Security. This one, though, reads, "Michael Williams Deportation Bus." Williams has labeled the stops on his tour "sanctuary cities," though they officially aren't. In 2009, state legislators passed a law banning sanctuary cities in Georgia. The "deportation bus" tour is set to make 27 stops around Georgia until the day before the primary on May 22. Protesters gather outside state senator and gubernatorial candidate Michael Williams's "Deportation Bus" in Clarkston, Ga. In Clarkson, protestors surrounded the door of William's RV as the candidate did private interviews with the news media. The crowd chanted "No hate! No fear! Immigrants are welcome here." Alex Tsegaye, who came to the U.S. from Ethiopia 31 years ago, owns a restaurant at the strip mall where the bus stopped. Even though the message seems to be directed at unauthorized immigrants from Mexico, Tsegaye said he felt targeted. "Right now, you feel unsecured a little bit," Tsegaye said. "You don't know what's going to happen, even though I'm a citizen." Williams spoke briefly to the crowd for less than five minutes, before getting back in the RV and following the bus to its next stop. Polls in the GOP primary for governor in Georgia consistently rank Williams last, drawing just a few percentage points. 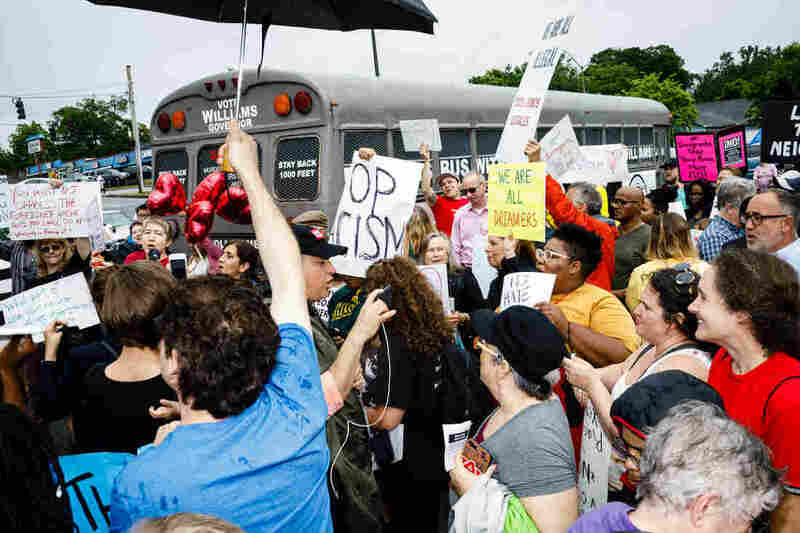 Williams contends the message on his bus isn't racist, and that it's about law and order. He says his campaign won't actually detain any unauthorized immigrants and drive them to the Mexican border. Although a campaign video featuring the bus seems to imply otherwise. "We don't want vigilantes out there, we don't want people to take the law into their own hands," Williams said in an interview. "We have no plans at all to put anybody on that bus other than our own campaign staff." Other candidates in the race for Georgia's next governor, including the front-runners, have fought over who's strongest against illegal immigration. While home to a large immigrant population, metro Atlanta is known for tough immigration enforcement. Local law enforcement in at least six Georgia counties have official agreements with U.S Immigration and Customs Enforcement to help apprehend, investigate, detain, and transport residents facing deportation. Lt. Governor Casey Cagle, the leading candidate in the race, has repeatedly attacked the Atlanta suburb of Decatur, claiming it's a "sanctuary city," and says it's violating state law. Police there recently put a policy into writing that prohibits arresting, detaining, or transporting individuals based solely on a request from ICE. Decatur officials said they're a welcoming city, not a sanctuary city. Georgia Secretary of State Brian Kemp, another GOP candidate for governor, recently released an ad with a similar message to the "deportation bus." "I got a big truck," Kemp says in the ad. "Just in case I need to round up criminal illegals and take them home myself. Yup, I just said that." Unauthorized immigrants in the state are worried this kind of rhetoric may incite actions against them, and the Latino community, said Jerry Gonzalez, executive director of the Georgia Association of Latino Elected Officials. "They're encouraging people to take matters into their own hands," Gonzalez said. "That's not the way the rule of law works particularly when it comes to immigration. I think it's a dangerous thing that they're doing." A previous caption misidentified the woman in the top photo as Lorna Seadore. She is Amina Osman.